On April 25th each year, Australia stands still. This is ANZAC Day, ANZAC being an acronym for Australia and New Zealand Army Corps. Across New Zealand and Australia tens of thousands of people will proudly remember all those countrymen who gave their lives in military service. While April 25th marks the anniversary of the first major military action fought by Australian and New Zealand forces during the First World War. On this date in 1915 the ANZACs went ashore in Gallipoli, to fight the Turks. , the commemoration has now been broadened to recognize not only the Gallipoli fallen, but those from both nations who have served in all theatres of war. A feature of ANZAC day is the Dawn Service. At the State War Memorial in Kings Park ,Perth, Western Australia, a crowd of 50,000 is expected, making it the world’s and Australia’s largest dawn event, beginning at 4.30 am. Across the nation, in small towns and capital cities a nation will remember its military as the sun rises. Gallipoli Day is also remembered in Ireland as it is estimated that some 3,000 Irishmen lost their lives in that awful place, many of them in the 10th Irish Division fighting alongside their ANZAC comrades, according to historian Jeff Gildea “Overall, the Irish lost more men than New Zealand at Gallipoli throughout the course of 1915,” Mr Kildea told the Irish Echo in 2010. One of our best known and loved folk singers, the late Liam Clancy, brought the Gallipoli story to many thousands who would not otherwise have known of this awful episode. His memorable and moving rendition of Eric Bogle’s The Band Played Waltzing Matilda can be heard by clicking on the link. A grim reminder of the awful cost of war. It is estimated that more than 6,000 Irish-born men and women served in what was known as the Australian Imperial Force during the First World War, with about 1,000 of them dying in action or as a result of their battle wounds. There is no doubt but that many thousands of Irish-born have followed them since. It is appropriate that we join our ANZAC friends in remembering this day too. On a recent visit to Australia, I visited the Queensland State Memorial at Anzac Square in Brisbane and share some of the photographs below in remembrance of them. My favourite memorial honours participants in the South West Pacific campaign. A Papua New Guinean helps a wounded Australian soldier descending the Kokoda Trail …. ..while a fresh and resolute soldier forges on into battle..
Easter was an exciting time for us children growing up in a Donegal home in the 1950s. Having survived standing for the long gospels of Passion Sunday and Palm Sunday, Holy Week arrived, with Spy Wednesday, Maundy Thursday, Good Friday and the Easter Vigil, each having its own unique catholic rituals. We were shooed off to the chapel for these ceremonies, and even though we had better things to be doing like playing cowboys and indians, we knew that it meant that dreary Lent was coming to an end. There was a definite sombre air about the place on Good Friday in particular, but once we passed 3 pm things lightened up a little and there was serious work to be done! We were dispatched to the hedges to find a nice branch – a nice elegant one with no leaves was the ideal. For weeks, my mother had collected eggshells after cooking and baking. The broken shells were carefully washed and left on a big tray to dry off. On Good Friday evening, we were allowed to begin painting them. Using standard children’s paint boxes, we painted them pink and blue and red and yellow and green and they were again left to dry. The branch was then painted white and left overnight. On Saturday my mother threaded a big needle and very carefully pushed it into the end of the painted shells and back out again, making a very neat little hanger. The shells were then hung on the tree and it looked just fabulous when the decoration was completed! She anchored the branch in a large vase and placed it on our very deep kitchen windowsill. The Easter tree tradition is kept up in my family, but the real broken egg shells have been replaced by more sophisticated ornaments! Time perhaps to revert to the traditional way of making the decorations! Our Easter Vigil church services began at about 9 pm and went on for several hours and it was not unusual for small children to sleep through the entire proceedings! My mother told us that if we were up at sunrise we would see the sun dancing in the sky in celebration of Easter, but of course none of us managed to be out of bed by 6 am to check this out. On Easter Sunday morning we did however have boiled eggs for breakfast. A big pot of them was put on to boil – some were eaten and others when cold were painted. These were then used for ‘egg rolling’. My father used tell us that when he was a boy they had very serious egg-rolling contests down grassy slopes, with everyone in the village taking part. There was nothing formal about our egg rolling, and the fun was between we siblings to see how far our eggs would travel. Chocolate Easter Eggs arrived later and replaced the egg decorating traditions that had been handed down for generations. The chocolate manufacturers mastered the technique of mass producing hollow chocolate eggs in the early part of the 20th Century. World War 2 brought rationing, so the Chocolate Easter Egg only became the norm for children after the 1950s. They didn’t reach our village until towards the end of that decade. Prior to this chocolate eggs were handmade and beautifully decorated by hand – works of art – as can be seen in the photograph below. A VERY HAPPY EASTER TO YOU ALL ! Early Cadbury Easter Eggs. Hand decorated, luxury items for adults. Living in Ireland, it is hard to ignore the momentous events taking place in our country at the moment. An Irish army officer at the President’s residence, announces Queen Elizabeth II – ”Banríon Eilís a Dó”. A short time later, an Irish military band plays ‘God Save The Queen, the British national anthem. The location is one of the most iconic sites in Ireland – the Garden of Remembrance, dedicated to the memory of those who gave their lives in the cause of Irish Freedom. The President of Ireland and the British Monarch ascend the 22 steps to the memorial sculpture to lay wreaths. 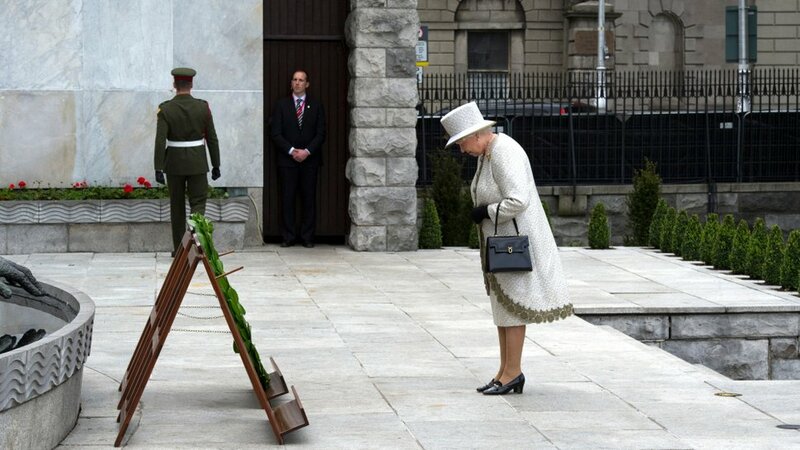 The Queen steps forward to lay her wreath. She steps back, then bows her head in respect for those who died for freedom – died fighting against her country. It is a poignant moment. It was indeed a symbolism beyond words. Today April 7, 2014, the President of Ireland makes the first state visit ever by an Irish head of State to the United Kingdom. It is a proud moment for the many tens of thousands of Irish people who, down the decades, have ‘taken the boat’ out of this country looking for new and better lives across the water. In that Kingdom they sought and they found employment and an escape from poverty. They worked on roads, construction sites, tunnels, building the infrastructure that made Britain, and most importantly, they sent money home to their families in Ireland. It is recognized that the money sent by migrant workers played a large part in the economic and social development of the Irish Republic. Men and women from Ireland, be they ‘tatty-hokers’ navvies, radio or tv personalities, actors, authors, clerical workers, soccer players, doctors, nurses, IT consultants, hospitality workers, refuse collectors – have shaped that society and are happy to call it ‘home’. They live there happily without hangups or begrudgery. They are proud of their Irishness, and proud of their British localities. Their Irishness is not defined by an angry agenda based on long gone history such as that expounded by many of the Irish American diaspora. We in Ireland have moved on – we can look back at our history to see where we have been and learn from it, and we can look forward to changing the future still more. Over the next few days, President Michael D Higgins as a guest of Queen Elizabeth and the people of the United Kingdom, is choosing to continue to change the future of our two nations. And once again, the symbolism will be beyond words.